Memorial Day (May31) will mark the unofficial beginning of Summer, when children and parents look forward to outdoor activities at area lakes and pools. However, accidents can happen if families take a holiday from safety. The good news is that most water tragedies can be prevented, if everyone remembers the basic rules of water safety. – Learn to swim and swim well. One of the best things anyone can do to stay safe in and around the water is learn to swim. No one, including adults, should ever swim alone. Adults should practice “reach supervision” which means to be within arm’s length of a child in case an emergency occurs. – Outfit everyone with the proper gear. Kids – and even adults – who are not strong swimmers or who appear to rely on inflatable toys for safety should use U.S. Coast Guard approved personal flotation devices (PFDs) whenever they are in or around the water. “This lifesaving lightweight plastic equipment when used properly can help save lives,” says Sean Penn, Red Cross aquatics program specialist. Everyone, including strong swimmers, should use an approved PFD when boating. Each person should have the appropriate personal flotation device for his or her weight and size, which is found clearly marked inside the label near the Coast Guard stamp. “A great idea is to make a family day out of learning the rules of water safety and shopping for durable safety equipment together at a local pool supply store or mass distributor,” Penn suggests. 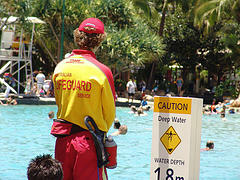 – Always keep basic lifesaving equipment by the residential pool and know how to use it. A first aid kit, cordless phone, phone list with emergency contact information, a reaching pole and a ring buoy with a nylon line attached are recommended. First aid kits should contain plastic face shields, which can help prevent disease transmission. Cordless phones allow you to make that 911 call and to receive calls without leaving the area. “Plastic makes the ring buoy so light even a child can save a life if the need arises,” points out Penn. “These items coupled with a pool emergency action plan—similar to a fire drill—help the whole family breathe a little easier.” In addition, the Red Cross recommends that pools be surrounded on all sides by a fence that is at least 4 feet high. It should not provide any footholds, which would allow a child to climb over or spacing to climb through. The fence should have a self-closing, self-locking gate that is locked when the pool is not in use. – Pack a “safety” bag for a day at the beach or lake. “The properly packed safety bag will help ensure a fun day in which everyone comes home safe and sound.” Water-proof sunscreen with an SPF 15 or higher, water shoes to keep feet safe from the heat and sharp objects on land and plenty of water are musts. All containers should be plastic to prevent injuries from breaking glass. Also, a hat and sunglasses keep eyes safe from dangerous UV rays. – Learn Red Cross first aid and CPR. “While the above tips can help prevent emergencies, it is important to know what to do if a situation arises,” says Penn. And all caregivers, including grandparents, older siblings and babysitters should have these lifesaving skills. For more information on staying safe in and around the water go to www.atlantaredcross.org or contact the Metropolitan Atlanta Chapter at 404-876-3302.